Submitted 3 months 5 days ago by supressed. 1.Safety First: S2 Charger's Compliant Standard--UL cUL TUV GS PSE FCC CE C-TICKCB ROHS, and with Fire Retardant Materials, Intelligent Circuits and Worldwide Warranty, Please confirm your battery is genuine / not damaged / quality before charging. 2. Universal Charger for: Ni-MH Ni-Cd A AA AAA AAAA C SC Battery, Li-ion LiFePO4 IMR INR ICR 26650 25500 22650 18650 18490 18500 18350 17670 16340 RCR123A 14500 10440 Batteries. 3. Speedy Charger for: Eneloop 2000mAh AA 2-Hour, Amazonbasics 800mAh AAA 0.8-Hour, 3400mAh Panasonic NCR18650B 3.5-Hour, 2500mAh LG HE2 2.5-Hour @ 1A Charge Current. 4. 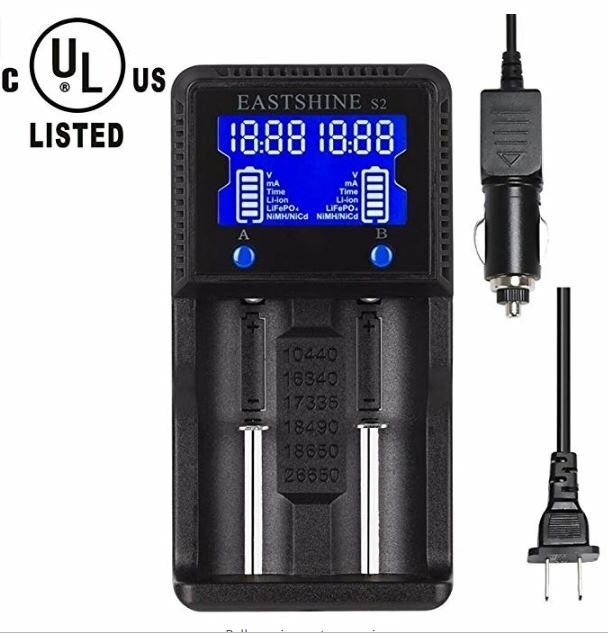 Smart Charger: Automatically Detect battery Status, Select Charge Mode, Cut Off Power at Full or Overtime, and LCD Display Each Cell’s Voltage and Type, Charging Current and Time. 5. What you get: S2 Smart Charger, Vehicles / Wall Adapter, Happy Card with 24 Hours Warm Service, 30 Days Free Refund, 2 Years Free Replacement, Lifetime Maintenance.